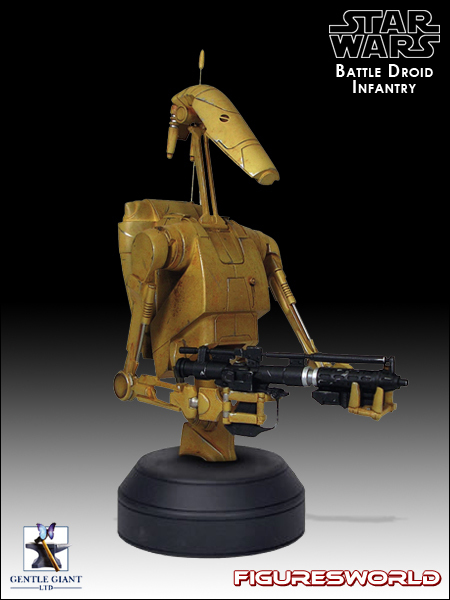 Now you can start building your Droid army with this film accurate, painted to perfection piece. This 1:6th scale mini-bust is a limited edition that comes with a matching, numbered certificate of authenticity. To assure 100% realism, Gentle Giant Studios three-dimensionally scanned the actors, costumes, and props as well as original uniforms and models from the LucasFilm Archives. This information was then processed, digitally output, and combined with traditional sculpting artistry to create the final sculpture, making these statues the closest one can come to owning a piece of the Star Wars universe. Battle Droids made up the backbone of the Trade Federation Droid Army and the Separatist Droid Army. B1s were perhaps the most numerous-and expendable-soldiers in galactic history, and, unlike most organic soldiers, they were capable of action in hostile environments like underwater or in space. They were designed, for the most part, to defeat their enemies through sheer numbers, not through the ability to think or skill, unlike their clone trooper rivals.